My Bible reading has been directed by the Holy Spirit. Yes, I realize that sounds crazy. No, I don't know exactly how I'm sure that's what's happening. But the name of a book of the Bible will pop into my head, and I just begin to read. Sometimes it's a challenge. I find that if I read something that doesn't make any sense at all, it's time to stop and look up the original Hebrew, or Greek. As my friend Bryan says, "Things are not always as they seem." I started to read the book of Joshua. Most people believe this is a nice happy-ending tale of how the nation of Israel finally enters the Promised Land. 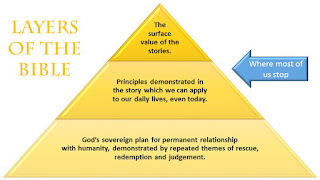 But, like many of the BIG stories in the Bible (Abraham being told to offer Isaac as a sacrifice, but God providing a sacrifice in his place; Jacob wanting to marry Rachel, but getting Leah instead; the Passover in Egypt) they are not only the original stories, but are also foreshadowing of other events yet to come. Those events are BIG. Oh, for goodness sake. Are you telling me these guys were supposed to walk around barefoot for their entire lives in the long-awaited promised land? Are you telling me there are no rocks, thorns, scorpions, hot sand, or inclement weather? That doesn't make any sense at all to a practical woman such as myself. Time to open BlueLetterBible.com and see whats really up. And that, my readers, is how the Bible Study Madness begins each time. I see something strange, I look it up, and then my whole world disappears for a couple (or more) hours, as I read, research, and scribble notes about what I've learned. Finally, I jot down my last note, take a deep breath, and realize I am completely exhausted. Exhilarated, sure, but also exhausted. Sometimes I just cry. That's what Holy Spirit School is like for me. Maybe it's different for you. Read the Book of Joshua yourself, starting around Chapter 3 and going through Chapter 6. They're short chapters, but packed with marvels beyond belief. Prior to Joshua chapter 3, Israel was supposed to enter the Promised Land, under the guidance of Moses. They balked, so God let them wander around the crummy desert for 40 years. That brings us to Joshua, Moses' successor. He's going to lead the Israelites (and probably some Egyptians in there, too) across the Jordan River. It's too deep and fast (it's Spring) for them to wade through and they can't build a bridge. 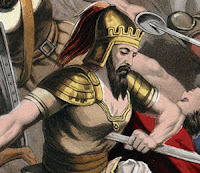 Joshua is a variant of the name Jeshua, or Yeshua. The Greek form is Jesus. I'm sure you're familiar with him. If not, you need to get on it, right now. The Jordan, as in Jordan River, means "descender" and it flows eventually to the Dead Sea, which is the lowest point of land on the entire Earth and is hypersaline, so it can't support life. It represents a natural descent of mankind to death, as a result of sin. In fact, in the King James Bible, verse 3:16 reads: "That the waters which came down from above stood and rose up upon an heap very far from the city Adam..." That made me laugh. Original sin indeed flowed a long, long way from Adam. If you prefer the NIV version, it reads: "It piled up in a heap a great distance away, at a town called Adam..." You just can't make this stuff up. The progression from sin to death was cut off by Joshua, the high priest, as the Ark of the Covenant of the Lord of the Whole World, passed through. God says something revealing in verse 3:7 "And the LORD said to Joshua, “Today I will begin to exalt you in the eyes of all Israel, so they may know that I am with you as I was with Moses." In other words, pay attention to Yeshua, Israel. God is with him. As soon as the toes of the priests hit the Jordan, the waters are withheld. The priests stayed in the riverbed until "the nation" had crossed over. The word isn't used exclusively for Israel. It refers to lots of people in various books of the Bible. Another clue. 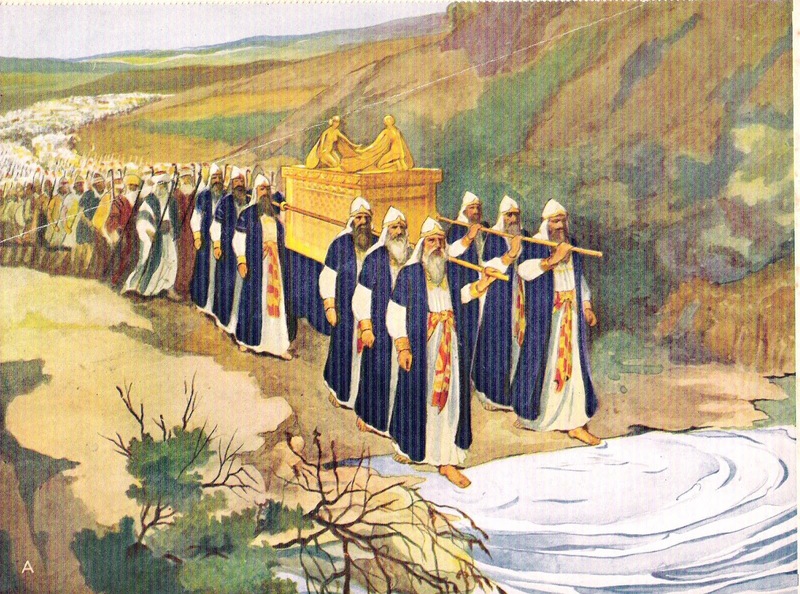 In verse 4:2, we find out there are 12 Levitical priests standing in the river. 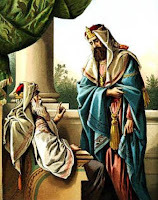 God tells Joshua to have a representative from each tribe carry a stone from the bottom of the Jordan, from the locations at which the twelve Levitical priests are standing, and to carry them to where the people will camp. 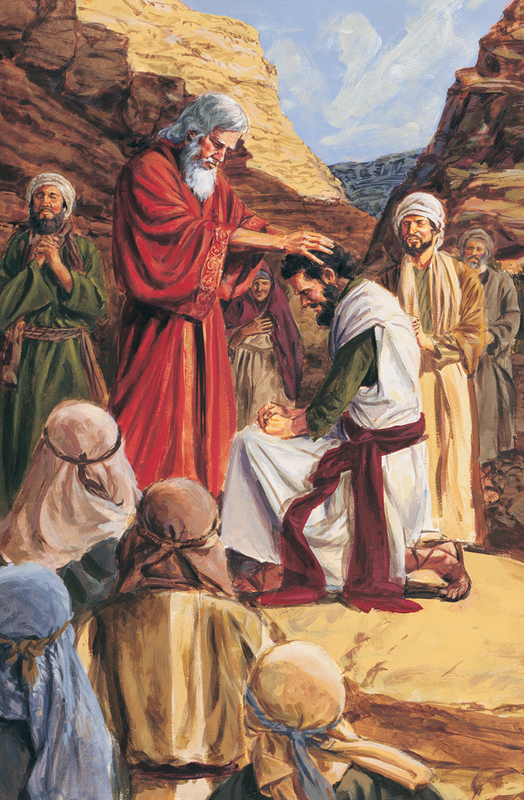 Get this...Joshua took 12 different stones of his own and places them where the 12 priests stood in the Jordan until Joshua was done telling the people what God and Moses has commanded him to speak. He wasn't standing in the river giving a speech, and he certainly hadn't reached the end of his leadership. What gives? And why did Joshua pick his own twelve stones out and put them where the Levitical priests were standing, but not one for "each tribe?" It seems like these stones represent the Apostles, replacing the Levitical priesthood. Whoah. Verse 4:10 says the Israelites “hurried” or "made haste" across the Jordan. It seems unlikely that over a million people, including animals, the Tabernacle, tents, women and children, were "hurrying" while Joshua was "speaking." And, they weren't being chased by anyone. Back to the Hebrew. The original word means "flowed like liquid, or were carried headlong." The word also means "transitioned." As in raptured. In the blink of an eye. 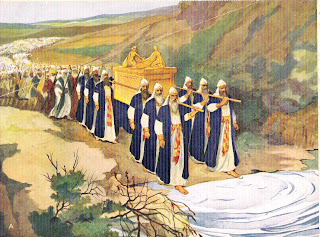 As soon as the priests came out of the river, the Jordan again flowed to the Dead Sea. After the crossing, judgement is restored. In other words, the Age of Grace is over. That's when the real trouble begins. Or, maybe this is a representation of the spiritual circumcision us Gentiles will face upon rapture? Verses 5:6-7 says it was Israel's offspring who entered the promised land, not the men people who came out of Egypt. Just as Israel balked at entering the Promised Land and balked at accepting Jesus Christ as Messiah, the gentiles accepted Messiah, and will enter the Promised Land in their stead. That's some amazing symmetry. Post crossing, after healing from circumcision, they all celebrate Passover eating the fruits of the plains of Jericho, halting their miraculous provision of manna. I found it interesting that there is no mention of them celebrating the Feast of First Fruits, even though that's commanded. Finally, I'm back to the part where Joshua is told by a man with a sword (Archangel Michael?) to remove his shoes, for the ground is Holy. The NIV says sandals, but that doesn't make sense, as I pointed out at the beginning of this blog post. Back to Hebrew. The original word refers to the sandal tongue, the removal of which signifies permanent occupancy of a place (physically or figuratively), willingness to get married (the church is called the Bride of Christ), and removal of something with no value (our sinful bodies). Joshua obeys. It's a short passage for something so important. And finally, for the next seven days, the nation besieges Jericho, a highly fortified city. Their plan of attack, given by God, is that the people, the armed men, and the priests march around the city with the Ark, while blowing seven shofars (ram's horns). At the end of the march, they go back to camp and repeat for a total of six days. But this part is interesting, In verse 6:10, Joshua commands the people to remain completely silent; no shouting, no speaking, no words are to come out of anyone's mouth until Joshua tells them they can shout. Hmmmm. Seven days of complete silence while God wages war on a sinful place. Seven days. 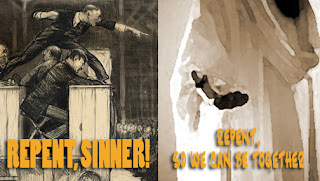 Seven years of an absent Church while God wages war on a sinful people. 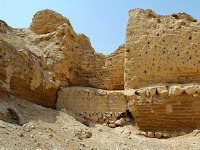 On the last day of the siege, the people are to march seven times around Jericho, the priests blow one long, last trump - LAST TRUMP - and then the people give a big shout. Jericho is vanquished, the walls fall, and everything in the city (except Rahab and her family) are set aside for the Lord's destruction. If that isn't a clear picture of the seven trumpets, the seven bowls of God's wrath, Jesus' triumphant return, and the utter destruction of bad guys, I just don't know what else to think. Note that it takes place after the seven seals are opened in Revelation. Do you see it? 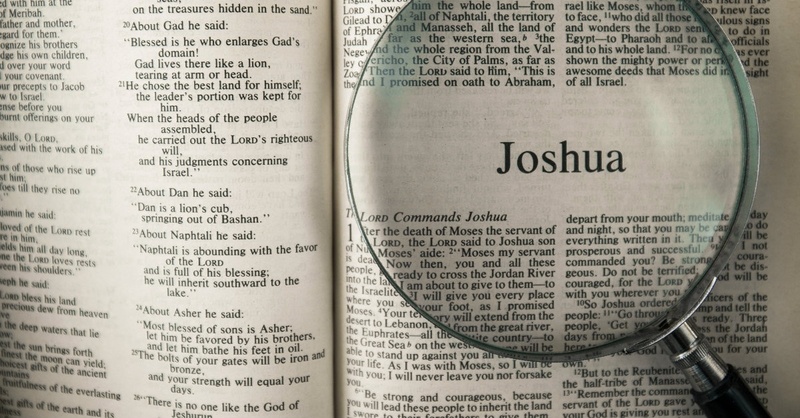 This part of Joshua is all about the Age of Grace, the Rapture, and End Times. You might be wondering when this took place. The crossing was completed on the 10th of Nisan, a day not really commemorated on the Jewish Calendar. Meaning, it's a day nobody is expecting or looking out for. Don't you think it's strange that Israel doesn't have a big celebration for the day they entered the Promised Land? I do. I mean, they have a Festival of Trees and that doesn't seem quite as significant as finally entering the land God promised them. Joshua is 24 books long, and I'm not done. Holy Spirit led me to read some of Hebrews next, and it turns out it's all about the difference in the order of Melchizidek vs. the Levitical priesthood. That can't be a coincidence, readers. And, I'm not smart enough to come up with this stuff on my own. This year, March 26th is the 10th day of Nisan, according to the Hebrew calendar. If you prefer the Enoch calendar, it's March 30th. Just thought you'd like to know. I can't say this is the day we all get raptured, at all. 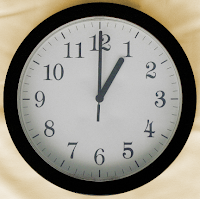 Nobody, NOBODY, knows the day or the hour. I believe we're in the season, and the story of Joshua leading the people through the Jordan is a great illustration to draw from. you seriously cannot make this stuff up! Amazing insight! 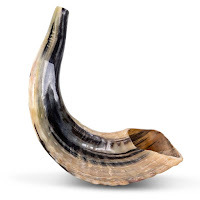 Julie, you blow me away, like a shofar! Seriously, you're making my brain hurt. Off to brush up on those missed parts in Joshua (apparently the whole book)! Thanks for your well thought-out insights. I have been watching Palm Sunday, Nisan 10, for several years, and was impressed when Ann Graham Lotz, mentioned the death of Billy on the same day Moses died. And that 33 days later Joshua brought the Jews into the Promised land, Nisan 10. I will be watching with much prayer. Thank you for commenting. Sometimes I wonder if anyone pays attention! It's heartwarming and encouraging to hear from fellow Watchmen. What boggles my mind is that Holy Spirit saw fit to share this with me. I barely read the Bible before the last seven months. God is so good. Eyes up, for sure. We'll get to meet in person soon enough! "If that isn't a clear picture of the seven trumpets, the seven bowls of God's wrath, Jesus' triumphant return, and the utter destruction of bad guys, I just don't know what else to think." You forgot the seven seals! Jesus won't open the first one until we're out of here. They're part of God's wrath, too. Hi Kathy! Thanks for posting. When I first read Revelation, I took note the first mention of actual destruction was the sixth seal. The other ones say that power is given, but doesn't specifically say those things happen. I don't know exactly what that means, but definitely took note of it. Also, have you compared the seals, trumpets, and bowls? It sounds like there's some overlap. I wish I could say I'm an expert, but I'm not. I can only faithfully share what is revealed to me. Thank you for this information. Amazing thing -- I am reading through the Bible in a year. I started on January 1, 2018. I was a little behind, so earlier today I read Joshua 1-6. Then tonight a friend send me this link and wanted me to read it. This friend has no idea that I'm reading through the Bible right now and especially didn't know I read the first 6 chapters of Joshua -- which is what your information is all about. God is GOOD!! And yes, Jesus is coming soon. 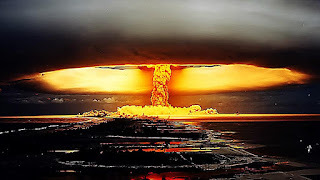 Christians get ready -- we are about to RAPTURE out of here!!! Eyes are up!! Now go read 2 kings and start at verse 2, and read all the way to WHERE Elijah was taken!!! We are definitely onto something! Yes, that is 2 Kings 2:11 where Elijah was taken up. Thanks for the reminder. We are definitely living in exciting times.